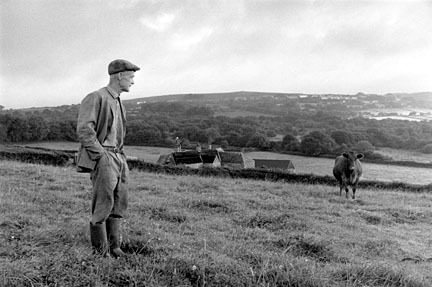 Photographed in 1998, Last Days at Truelove Farm is a major exhibition by Chris Chapman, documenting the preparations and the sale of a farm in Devon that had been in the Dennis family for five generations. The pictures lead us through their working lives, the day of the sale and the last day on the farm as the family moves out. First shown in Exeter City Museum to celebrate The Year of Photography 1998, the exhibition has subsequently toured the British Embassy in Brussels (spring 1999), Plymouth Arts Centre, Devon (winter 1999) the Royal Devon & Exeter Hospital (summer 2000), The Delta Centre, Exeter Devon 2001, Devon County Hall, 200. and The Glastonbury Museum of Rural Life (summer 2002). The story also appeared as a five page spread in the Independent on Sunday in November 1998. In partnership with Devon County Council, the exhibition, consisting of 28 large framed black & white photographs, is available for hire. Booking and further details from Chris Chapman on Tel & Fax: + 44 (0)1647 231508.